Case IH’s new flagship Steiger 600 leaves the competition behind with more productivity-enhancing features and a new, fuel efficient and powerful engine that does not require AdBlue. According to Case IH Product Manager Tim Fanning, the new Steiger 600 tractor is superior to a key competitor model in the market in several aspects. When the new 4WD tractors were compared to a key competitor, the Steiger performed considerably better across all important categories from power and drive train to operator comfort and visibility among others. The tractor currently holds the Iron Solutions Award for best resale value in the industry in the 4WD segment. One of the highest horsepower 4WD tractors in production today, with Nebraska test proven best-in-class fuel economy and a large, spacious cab, Case IH Steiger also offers at least nine standard features not offered on the leading competitor model including a multi-controller armrest and Class six automotive grade paint. For instance, the Case IH Steiger showed far better visibility over its competitor, which had visibility-reducing features such as exhaust and air cleaners on the same side and a higher nose profile. Overall, the Steiger range delivers a performance premium of more than five per cent in comparison with the leading competitor range. The new Steiger was launched along with Case IH’s new Magnum range late last year. 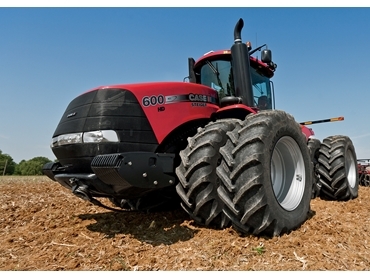 Case IH chose to provide high horsepower tractors without SCR or EGR emissions controls. Tim explains that their customers need equipment that is simple, fuel and fluid efficient, and cost effective to run. He adds that the new models give Australian farmers the option to choose some of the most powerful and efficient engines without the increased operating costs that accompany emissions reduction technology. Both the new Magnum and the new Steiger set industry records for fuel efficient power in the independent preliminary Nebraska Tractor Test Lab results. Almost one in every two articulated 4EWD tractors sold in Australia last year was a Steiger, making this model the market-leading 4EWD tractor.